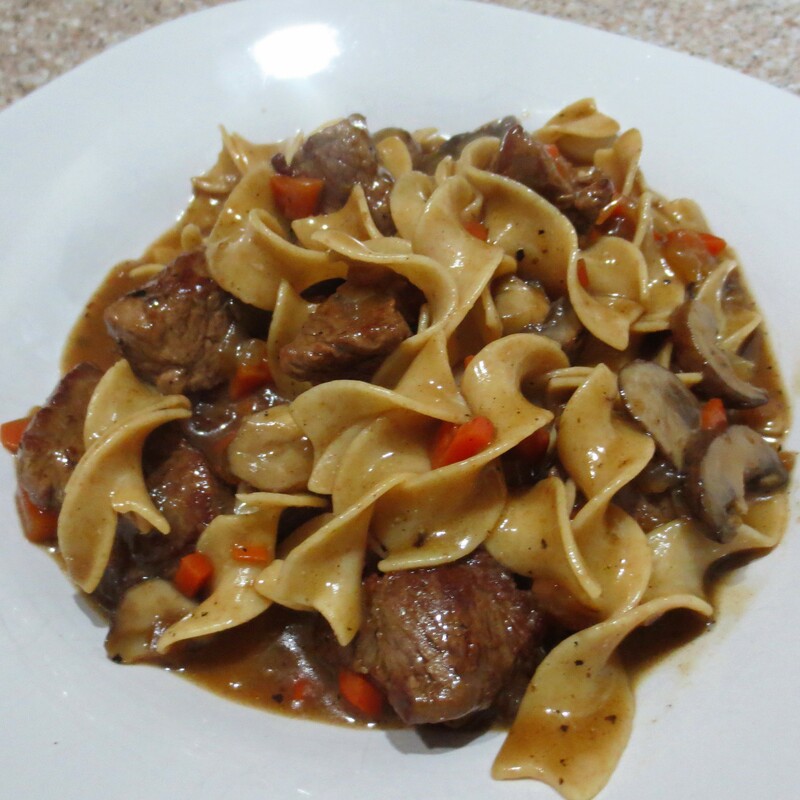 Beef Stroganoff is typically served over wide egg noodles, garnished with fresh parsley. The steak may be either cut into small cubes or strips. I think the cubes stay more tender, particularly if they are quickly seared over high heat and then set aside while the sauce is prepared. 1. Season the beef with half the salt and pepper. 2. Heat a large skillet over medium high heat. Add 1 Tbsp of the oil and quickly sear the beef until browned but not cooked through. You may have to sear the beef in two batches so as not to crowd the pan. Remove to a plate and set aside. 3. If you have cubed the beef, halve or quarter the mushrooms and dice the onion. If the steak is sliced, slice the mushrooms and onions. 4. In the same skillet, heat the remaining canola oil. Add the carrot, mushrooms, and onions. Cook, tossing frequently, until softened and beginning to brown around the edges, then season with the remaining salt and pepper. 5. Off the heat, pour in the brandy. Return to the heat and stir up any browned bits in the bottom of the pan, Allow to reduce a bit. 6. In a small bowl or cup, stir the cornstarch into 1/4 cup of the broth and set aside. Add the remaining broth to the skillet along with the reserved beef and any beef juices on the plate. 7. When the beef mixture is very hot stir in the cornstarch mixture. Cook and stir until the sauce begins to thicken, then turn off the heat. Stir in the sour cream and mustard. Serve immediately.